Sorry to start a a controversial thread so early into joining-- I understand "artisanal designers" like this are not part of the common culture on this Forum-- That being said, there is a lot of discussion elsewhere on the Artistic Value of these makers, but not technique and construction. Is anyone else interested around here? I'm talking about the likes of Geoffrey B Small, Carol Christian Poell etc. "hand dyed superlux handwoven Tessitura La Colombina silk, linen & cotton with fully handpadstitched canvas fronts, hand made shoulder pads, buttonholes & buttons." . . . . silk, linen & cotton with fully handpadstitched canvas fronts, hand made shoulder pads, buttonholes & buttons." Which is just what I like doing. I hope you are right supercilious, in regard to a widening interest in handwork and care in craftmanship. I like that myself, or I would not be heere on this forum. Although I am from Australia, could you explain what kangaroo canvassing, I guess it is a perjorative term. I like the innovative pockets very much. The hdden ones behind the lapel and curious curves are great. And, yes I think you are correct, in that when you are focussed on handwork, which I do when I want control of the seams, and I may lack expertise on the machine, you can get more involved in innovation. Perhaps I will post elsewhere, but as a novice weaver I'm working on a few projects now from the ground up so to say. I'm glad he is not unheard of on this side of the internet, also, I've never made that connection-- is that a quote from somewhere? I just assumed they had a shared affinity for (lack of better words) the Arte Povera aesthetic. 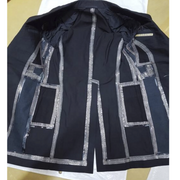 Perhaps I phrased the intro to this thread a bit clumsily, but I find that there is so much (undiscussed) technical work out there there that steps outside of, from my opinion, a rather homogenous school of thought within tailoring. Yes, some tailors do padding by hand, some put paste in buttonholes, but I don't know if there are many who question what it means to be an artisan maker i.e. It seems that the proverbial tailor is solely concerned with the garment to the context of the individual, but not what it can mean in a broader scale. I have been thinking a lot about tailors recently, today on the way to class, I thought God ruins a tailor's posture as an exhibition of their modesty. The history of tailoring, if looking at paintings, is rather wild from today's perspective. There are not many tailors left. And few, today, want to step out in new territory. One picture reminds me of steampunk. Steampunk is play clothes. The tailoring world has made lots of play clothes throughout the centuries. It depends on the interest of the tailor. Making clothes for boys is far from businesses suits. Teens are not interested in business suits. How many twenty and thirty year olds have been reprimanded for wearing clothes to fashionable for work? And, who made those clothes? In the past wealthy children did not go to stores to buy clothes. And they were all completely hand sewn. Many tailoring guilds would not consider machined clothing up to the standards of quality clear into the 1920s. About ten years ago my mom died saying machined clothing is not tailored. The old standard's, are they wrong? Machined clothes are great for cheaper clothing. The pictured clothes above are not high standard, hand sewn or not. As far as art goes tailoring has to be art, or it is not tailoring. Art is many things.